Abstract: Each of these PC4000EL modules are 512MB in size, and since they are destined for dual channel systems, OCZ sell the memory as a pair. The memory market is pretty saturated right now with high speed memory modules from every corner, and in an attempt to differentiate themselves from their competitors we've noticed that OCZ have been tightening up their memory timings just a bit. After all if you're running PC2100 DDR and PC4000 DDR at stock speeds, it really doesn't make any difference to the computer.... but then if you overclock that is where speed, and memory timings really come into play. For an illustration of just what we're talking about, please read through PCstats look at Memory Latency VS Bandwidth. For the rest of you who know what tight memory timings can really bring to the table, read on! In this memory review, PCstats is testing out OCZ's Gold Edition PC4000EL DDR. Each of these PC4000EL modules are 512MB in size, and since they are destined for dual channel systems, OCZ sell the memory as a pair. The OCZ PC4000EL DDR is rated to run up to 250 MHz while maintaining timings of 2.5-4-4-7, at 2.8V. That's not exactly as tight as some other lower speed modules, but it is better than the 3-4-4-8 timings most other high speed DIMM's run under. Officially, OCZ use gold plated copper heat spreaders to help keep the DIMM's "cool," but as we all know, memory heat spreaders do little to nothing for memory cooling. What they are good for is protecting the DIMM's from physical damage. OCZ use Hynix HY5DU56822BT-D43 TSOP-II DRAM in the PC4000EL Gold DIMM's, but that shouldn't be much of a surprise as most memory manufacturers use the "D43" memory for PC4XXX class memory. 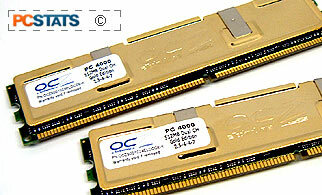 Each DIMM is equipped with sixteen 256Mb DRAM modules, which total 512MB of memory when things are all said and done. If you're contemplating buying new memory for your PC, please keep in mind that the OCZ PC4000EL Gold Dual Channel memory is intended for the i865PE/i875P Intel chipsets. OCZ state that themselves in the product description. Unlike previous OCZ memory we've tested, this time we agree with their assessment 100%... read on and you'll see why. We almost always start with the Athlon64 tests first, just because it tends to be a little more finicky about what memory it likes. After plugging the memory into the Athlon64 test bed, we opened up the BIOS and configured the first round of tests with lax timings. This is mainly due to experience with Hynix D43 DRAM in the past which we found to only work with stock timings. As we began to raise the clock speed of the AThlon64 motherboard, the memory quickly bottomed out at 206 MHz. No matter what we did; lower the memory timings or raise the voltage, it didn't have any effect. This isn't all that surprising as virtually all high speed DIMM's on the market (from various manufacturers) perform poorly on AthlonXP/Athlon64 based systems which are really driven by tighter memory timings than anything else. Moving forward with the Intel tests, I anticipated that the OCZ PC4000EL memory would handle that task a little better, after all this memory is designed to run on the Intel platform. Starting at 200 MHz FSB with a memory voltage of 2.6V (yes, lower then recommended) we began to push the memory forward. At around 223 MHz it ran into a few problems, but that was solved by increasing the memory voltage to 2.8V. At that voltage the memory easily passed its theoretical rated speed of 250 MHz FSB and we went from there with the tests at 268MHz which was nice and stable.